Mongolia is willing to be a bridge linking European and Asian continents and will actively participate in mutually beneficial cooperation under the Belt and Road Initiative, Erdenebat said. Chinese Premier Li Keqiang met with his Mongolian counterpart later Friday. Li said China is willing to invest more in the construction of China-Mongolia border ports, cross-border economic and trade cooperation, and work on a joint feasibility study on a China-Mongolia free trade zone. Li said the cooperation consensus reached by the two sides on housing construction, processing of agricultural and animal products and use of energy should be implemented to achieve a win-win outcome and common development. 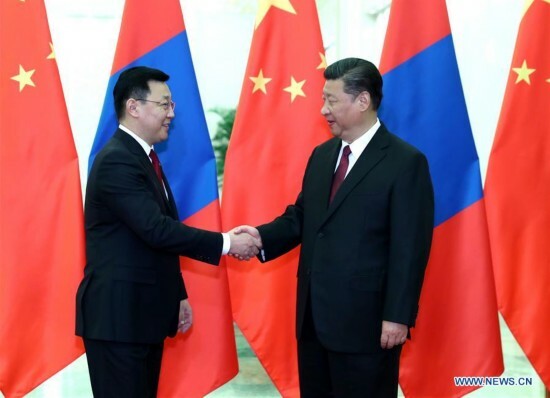 Erdenebat said Mongolia respects China's core interests and appreciates its good-neighborly and friendly diplomacy. He went on to say that Mongolia is willing to strengthen practical cooperation with China on areas covering minerals, agriculture and animal breeding, housing, construction of border ports, cross-border trade, environmental protection, and renewable energy. After their meeting, Li and Erdenebat witnessed the inking of documents related to areas including bilateral economic and trade cooperation and people-to-people exchanges. Chinese Vice Premier Wang Yang also met with Erdenebat separately, saying the two countries should enhance mutual trust, seize the fresh opportunity of joint Belt and Road construction, and increase the volume of bilateral trade and investment. Wang called for quickening the pace of the study and building of a free trade zone, jointly promoting cooperation on major projects, and deepening people-to-people exchanges. For his part, Erdenebat said Mongolia is willing to strengthen practical cooperation with China on various fields.